Ready to expand your presence and activity on the state of Florida’s College Campuses? FloridaACE is easy and affordable to join. Take a look at some of the many Career Professionals and Employer benefits FloridaACE offers! Click on the respective link below to create your new membership. Payment and mailing instructions are provided on the membership form. You have the option to pay by check or credit card (Visa and MasterCard are accepted). 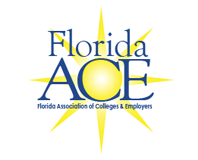 For more information about joining FloridaACE, contact the FloridaACE Secretary at [email protected]. Affiliate Members are professionals who do not meet the criteria for other categories of membership and who provide support products and/or services to the recruitment/career services functions; or are working in fields related to career services and/or college recruiting. Such members may include, but are not limited to, employees of contract recruiting firms, outplacement firms, employment agencies, career assistance centers, publishers of career resources, companies that provide career management software tools or other organizations related to the overall functions of career services, human resources and/or university recruiting/relations. Affiliate members are not eligible to vote, hold office, or chair a committee within the association.